Officer Francis Doyle was shot and killed as he and several other officers attempted to force entry into a home at 339 Maryland Avenue while conducting an investigation. Officers had gone to the home earlier in an attempt to recover a stolen watch and were held off by the suspect's wife. When the officers returned the forced the door open but were immediately fired at by the woman. Officer Doyle was struck in the chest and killed instantly. The woman was charged with murdering Officer Doyle but acquitted at trial. Officer Doyle was a U.S. Navy Veteran of the Civil War. He had served with the Metropolitan Police Department for five years and was survived by his wife and three children. He was buried at Congressional Cemetery in Washington, DC. Born in Limerick, Ireland son of Peter & Catherine (Nash) Doyle. 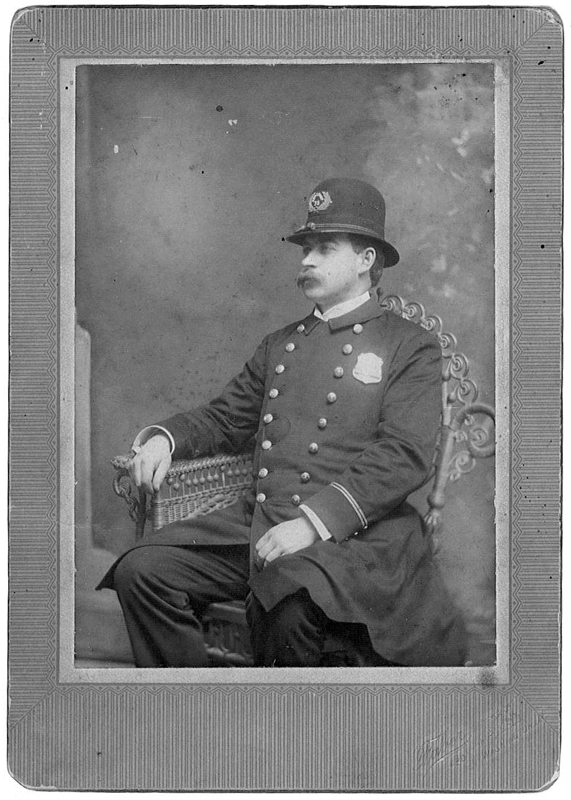 Prior to his police service, Private Doyle was employed as a blacksmith at Washington's Navy Yard, in the 1850's and early 1860's. At the outbreak of the Civil War, he enlisted in Captain Robert Clarke's Company of DC Infantry, on April 24, 1861. serving a three month enlistment and being discharged on July 24, 1861. He reenlisted in the Navy on March 2, 1865, serving as a firemen on the Man-O-War Wabash until his discharge on April 18, 1867. *Captain Robert Clarke's Company" is "Major Robert Washington Clarke" who is Francis Michael Doyle's Uncle Michael Nash's 2nd Wife's (Ann Maria (Clarke) Nash) Brother." 22 Feb 1860 National Intelligencer lists "Special Police" Francis' cousin William Nash was listed & maybe when the family started serving..
On February 15, 1868, Francis Michael Doyle was appointed as a member of the Metropolitan Police Department, and would serve continuously until his untimely end. Private Doyle's funeral was held On December 31, at his home, 340 K Street SW, with Reverend Father Call officiating. Following the service, a funeral cortege was formed with fifty-two police officers under the command of Lieutenant Gessford, conveying his remains to Congressional Cemetery for interment.